The Junior Golf Association of Arizona (JGAA) will host the 2019 Itty Bitty Open on Saturday, January 12 at 20 Valley-wide locations. Free and open to all kids ages 3-5 years old, the event features three clinic times per location (9, 10 and 11 a.m.) where juniors and their parents will learn the basics of golf taught by qualified PGA and LPGA professionals. 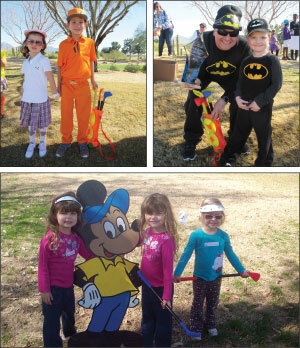 After the clinics, the kids will participate in fun-filled, non-competitive golf games and tournaments. Each golfer will receive a set of plastic golf clubs, balls, a bag, and a visor – participants are asked to leave their own clubs at home. An adult “caddie” must accompany each golfer. A special contest with prizes will be held at each session for the “Best Dressed Golfer and Caddie Team.” Anything goes: classic golf fashion; contemporary golf fashion; or any unique golf duds that may come to mind. All winners will receive a congratulatory letter, a trophy, and two tickets for the R.S. Hoyt, Jr. Dream Day Activities at the 2019 Waste Management Phoenix Open presented by Ak-Chin Indian Community (kids are already allowed to attend it at no charge, so the tickets are for parents or other adults). Space is limited, sign up before January 7 deadline. RSVP to 602.944.6168, or visit www.JGAA.org and click on Itty Bitty Open to learn more and locations.